Trauma and/or stress, be it physical or emotional can have a negative impact on your brain and nervous system. They can also compound over months and years resulting in a wide variety of symptoms. Your brain is capable of optimal functioning, but when your central nervous system is off kilter your brain operates inefficiently. Why Use Brain Wave Coaching & Technology? Brain Wave Coaching & Technology uses NeurOptimal® a non-invasive technology which is designed to focus on the central nervous system - the hub of all functions in the human body. Over time specific types of problems... physical, mental and/or emotional, become less important and symptoms dissolve. Brain Wave clients have experienced successful outcomes across a broad spectrum of complaints. Brain Wave Coaching & Technology can help you sleep better, lessen your stress and anxiety, and reduce any other symptoms that prevents you from experiencing a healthy balanced life. 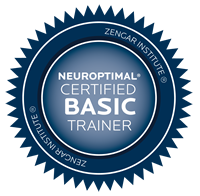 NeurOptimal® is considered to be one of the most highly evolved forms of neurofeedback available today. After more than 20 years in the neuroscience field and related disciplines Dr. Valdeane Brown and Dr. Susan Cheshire Brown, have developed a safe, effective system that gives feedback directly to your brain allowing it to regulate itself more efficiently. The Benefits of Brain Wave Coaching! Though NeurOptimal® is not a medical treatment for illness, people have experienced relief from a wide variety of physical, mental and emotional symptoms. Athletes, business professionals, students and musicians have also experienced performance.